A boost of freshness from wash to wash. In-Wash scent booster with sparkling citrus & juicy fruits fresh scents wrapped into floral notes. Personalise the scent intensity by choosing the quantity of beads you want to use. Pour beads directly into the empty drum before your laundry. Lenor Unstoppables in-wash scent booster are available in different scents. 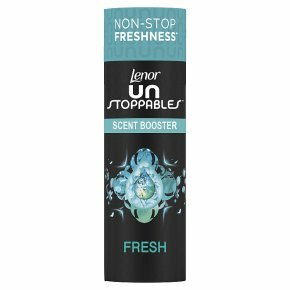 Available in different scents, each Lenor Unstoppables fragrance provides an in-wash scent boost that injects freshness into every wash. A boost of freshness from wash to wash, Lenor Unstoppables keeps up to 12 weeks with boosted freshness (in storage), so your clothes are always ready to wear, infused with your favourite scent.Our scent experts recommend Unstoppables Fresh If you are looking for a sparkling citrus and juicy fruits scents wrapped into floral notes. For an optimal use, Lenor Unstoppables should be added into the empty drum before every wash; then add clothes, detergent, fabric conditioner, your usual laundry routine. Keep out of reach of children. IF IN EYES: Rinse cautiously with water for several minutes. Remove contact lenses, if present and easy to do. Continue rinsing. IF SWALLOWED: Immediately call a POISON CENTER/doctor. Dispose of contents / container in accordance with local regulations. Harmful to aquatic life with long lasting effects. May produce an allergic reaction.